Mahatma Gandhi University has announced the CAP degree trial allotment results at admission website www.cap.mgu.in. The CAP degree 2014 provisional index mark rank and trial allotment list for admission to degree courses in affiliated arts and science colleges are currently available at the admission portal of the University. Applicants can view, modify, and rearrange options from 14th June. The first allotment is expected to get published by the third week of June. 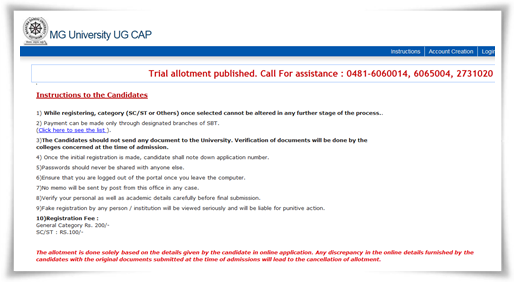 To check the trial allotment, applicants must have to login to the official CAP portal of M G University. Even though, the trial allotment doesn't make sure an admission for a course, but it will give the students an idea about the chances of getting allotment to a degree course in a college. After the period earmarked for revising options, the University will publish the first allotment list. The techno-intensive allotment process has given convenience for the applicants to check the allotment with ease. To check the trial allotment, students must have to visit the official website, login with the application number and password and view their UG CAP profile page. As the trial allotment got published, it is very important to mention about the further procedures regarding the admission. After the time allocated for the modification, the University will publish the first allotment which marks the real admission to colleges. Students, who found their names in the list can download the allotment memo and chalan, take printouts; remit the prescribed fees given in the memo in any of the designated branch of SBT. Along with the relevant documents, students should report to the principal of the allotted college. Mahatma Gandhi University, Kottayam has already become the hub of education in the state. Other than natives, students from other states to joining colleges are also attracted to join colleges under the University for the hospitality provided. Along with existing 116 plus courses, few more new courses to be exclusively introduced this year. The University shall marginal increase in the number of seats for various undergraduate programmes adding more seats to the existing 21,000 seats. Over 6,000 seats will be made available for science courses under the Centralized Allotment Process (CAP) while 6,278 are allocated for B. Com and 1,941 for B.A. Economics. To know more details about the trial allotment visit the official CAP web portal of Mahatma Gandhi University. MG University (MGU) UG degree admission process CAP 2014 first allotment results will be published at the official website on 19th June (Today). After the verification of the first allotment, students should have to remit the fee due to University at designated branches of SBT before the stipulated time. The allotment will be published on www.cap.mgu.in. Candidates, who had applied for the courses, can check the first allotment by logging in the official CAP portal of the University.